Kids Vitamins: No Pills, No Sugar, Great Option! : Great in smoothies! You are here: Home / Featured Products of the Week / Kids Vitamins: No Pills, No Sugar, Great Option! Kids Vitamins: No Pills, No Sugar, Great Option! Great in smoothies! With summer coming, it means long days playing in the sun, camp, family trips and lots of activity! But one thing parents don’t want to forget….proper nutrition…making sure their kids (Moms & Dads, too!) gets all the essential vitamins and minerals. And sometimes that is not always all in their food. Taking a multi-vitamin is recommended by doctors, but over 40% of Americans have difficulty swallowing pills. And gummy vitamins contain added sugars and not all of the essential nutrients. I don’t know if your child is like my son, but he is not crazy about taking his vitamins! He does like the Gummy ones but they do have sugar. I was quite excited to find out about this alternative! I also like that there is no sugar and they can added to smoothies! Now, who doesn’t like a smoothie? 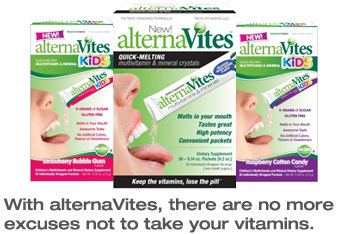 In 2010, alternaVites, were introduced, a comprehensive multivitamin & mineral in crystal powder form that melts quickly in your mouth – the first of its kind. alternaVites quickly became the definitive “non pill” vitamin option and filled an unnecessary void in the market. With its success, it became clear to us that alternaVites is a product that’s great for everybody, not just those of us who have difficulty swallowing pills. Its convenience, delicious taste, portability, and high potency formula gave it much broader appeal. While a children’s product was always part of the plan, they were overwhelmed with requests to develop an alternaVites formula that would be suitable for kids. Understandably, parents were equally as unhappy with the choices available for their children as they were for themselves. They were disappointed in products with high sugar content, incomplete formulas, and artificial ingredients. They listened to these concerns and developed alternaVites Kids – a children’s multivitamin & mineral that has awesome kid-approved flavors while maintaining the integrity, quality and versatility associated with the originalalternaVites formula. Kids has revolutionized the children’s vitamin category as they no longer have to be the chalky chewable we grew up with, or a sugary gummy that’s missing essential nutrients, and can stick in between our children’s teeth. Now, what is really cool is that there is not any bad after taste. They really do taste good! I even tried them. I was quite impressed that they tasted good. Available in two awesome flavors: strawberry bubble gum and raspberry cotton candy. *However, we encourage all parents of children with food allergies or sensitivities to consult with their child’s doctor or pediatrician before use. There are also ones available for adults! It is available in Mixed Berry! 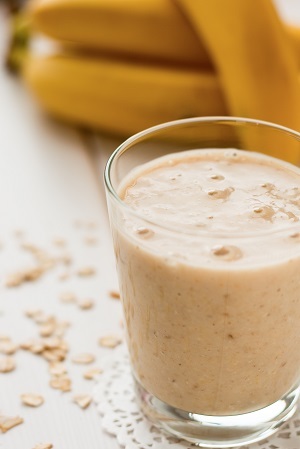 Now, for three great smoothie recipes! I tried two of these and they are quite tasty! Direction: Place all ingredients in blender. Blend until smooth and creamy. Enjoy! And alternaVites are MADE IN USA. And just in time for Back to School, alternaVites Kids is launching stand-alone Vitamin D, Vitamin C and Calcium supplement packets. alternaVites Kids is one of the most versatile children’s multivitamin & mineral products on the market! Other than sprinkling alternaVites Kids on the tongue, it can be mixed with smoothies, shakes, yogurts and/or puddings. You can also sprinkle it on top of their favorite fruit and you can get creative! Just remember, the entire packet must be consumed to provide the daily dose. With alternaVites and alternaVites Kids, there are no more excuses for children and adults not to take their vitamins! Self Disclosure: I received free samples to facilitate this post. Photo Credit: alternaVites/alternaVites Kids.